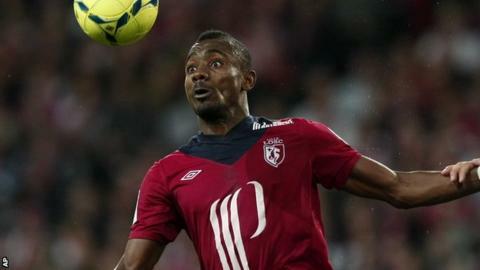 Former Chelsea forward Salomon Kalou has joined Hertha Berlin from Lille for an undisclosed fee. The 29-year-old Ivorian, who scored 60 goals during a six-year stint at Stamford Bridge, has signed a three-year deal with the German club. "Kalou is a top striker," said Hertha general manager Michael Preetz. "He has proved his class in the Premier League, Champions League and with his national team. We're very happy to have him with us." Kalou, who has 23 goals in 67 appearances for Ivory Coast, will be expected to replace Colombian striker Adrian Ramos, who recently moved to Hertha's Bundesliga rivals Borussia Dortmund. Kalou began his career with Rotterdam clubs Feyenoord and Excelsior before switching to Chelsea in 2006. He scored 60 goals in 251 games and won the Champions League with the Premier League side before joining French club Lille, where he scored 30 goals in 67 league appearances. Also on Sunday, Tunisia striker Sami Allagui left Hertha to join Bundesliga rivals Mainz on a year-long loan with an option to buy.